The Battle of Brown's Marsh was the last in a long line of military encounters in North Carolina at the end of the Revolutionary War, following Loyalist colonel David Fanning's capture of Whig governor Thomas Burke at Hillsborough on 12 Sept. 1781. The precise site of the battle, as well as its exact date, is currently unknown, but it likely took place sometime between 28 Sept. and 2 Oct. 1781 near present-day Clarkton in Bladen County. While attempting to convey their valuable prisoners to the British garrison at Wilmington, Fanning's command was ambushed by Gen. John Butler's Whig army at Lindley's Mill in what is now Alamance County on 13 Sept. 1781. The Loyalists managed to extricate themselves, but Fanning was severely wounded and his command devolved to Col. Archibald McDugald. McDugald led his army and prisoners through the Sandhills en route to Wilmington, stopping at the Loyalist stronghold of McPhaul's Mill to regroup and turn over the captives to a swifter party commanded by Col. Duncan Ray (although some of the Loyalists escorting the prisoners from Hillsborough continued on the journey). Hearing news of the successful raid, Maj. James Craig, leader of the British force in Wilmington, went up River Road to meet the Loyalists. Governor Burke and his fellow prisoners were delivered to Craig at Livingston Creek by 23 Sept. 1781. Meanwhile, Butler had gathered what militia he could and set off to overtake the Loyalists and liberate the governor. When word of Butler's plans reached the British at Wilmington, Craig dispatched a Major Manson and 180 British regulars from the Wilmington garrison to accompany the Loyalists as far as Brown's Marsh. Scouts soon brought news of Butler's exact location back to Manson, who planned to attack the Whigs before they found out that the Loyalists had been reinforced. The British rode all night through swamps and forests that required expert guides to negotiate. When close to Butler's camp, Manson divided his force into three wings: the British regulars, the Highlanders, and a contingent of Fanning's command under Capt. Steven Holloway. Each wing was accompanied by an experienced guide who was believed to be able to bring the respective units into position for the attack but who ultimately proved unprepared for the task. As the British were groping about in Brown's Marsh, the Whigs had been alerted to their presence and hastily prepared defensive positions. Heedless of this setback, Manson ordered an attack in the predawn darkness. From the outset, consternation reigned in the Whig camp. As he had at Lindley's Mill, Butler ordered a retreat soon after the fighting began, but once again Col. Robert Mebane stepped forward to stop the Whigs' flight-though on this occasion, even with the help of Col. Thomas Owen, his efforts were only temporary. In less than an hour, the Battle of Brown's Marsh was over. The British had routed the Whigs and were now in possession of their camp, while the Whigs were fleeing north to safety with Butler at their head. The victory cost the British two killed and five wounded-both deaths coming from Fanning's men, including their leader, Captain Holloway. The Battle of Brown's Marsh capped a successful campaign in what was to be the high point of the Loyalists' efforts during the Revolutionary War. John Hairr, Colonel David Fanning: The Adventures of a Carolina Loyalist (2000). 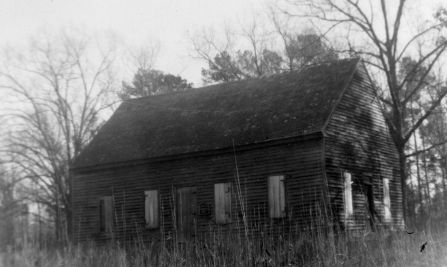 Brown Marsh Presbyterian Church, Bladen County, North Carolina, 1828. Image courtesy of Special Collections Research Center at NCSU Libraries. Available from http://d.lib.ncsu.edu/collections/catalog/bh0036p05 (accessed August 28, 2012). I grew up in that area less than a mile from the church. My brother and I would roam them woods as a boy and he found a cannon ball in the swamp area just south from the church.